In this day-and-age, for most pet parents, having a dog is like having a child; we only want the best for them, this includes their safety. The wireless dog fence can be a huge asset in assuring your pooch's safety as well as providing him with the freedom being tethered simply does not. In this article we are going to cover eight of the best wireless dog fences, their pros and cons as well as some frequently asked questions and training tips to help you make an informed decision for your canine companion. Wireless vs Underground Dog Fences. Finding The Best Invisible Dog Fence Doesn’t Have to Be Difficult. 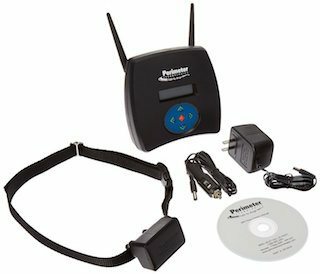 FAQ(s) About Wireless Dog Fences. This guide looks at the potential of the wireless electric dog fence as a helpful tool for pet owners. These fences are a great way to set up within a small yard. The transmitter send a warning to a dog collar if the animal strays beyond a certain radius from that central point. It can make a difference in smaller, residential settings. However, there are in-ground alternatives for those in other circumstances. These wires run through the ground in any configuration that users need. This makes them ideal for oddly shaped areas of land. They also tend to have a wider range than the best wireless dog fence models. Times when a wireless dog fence may not be suitable for your home. 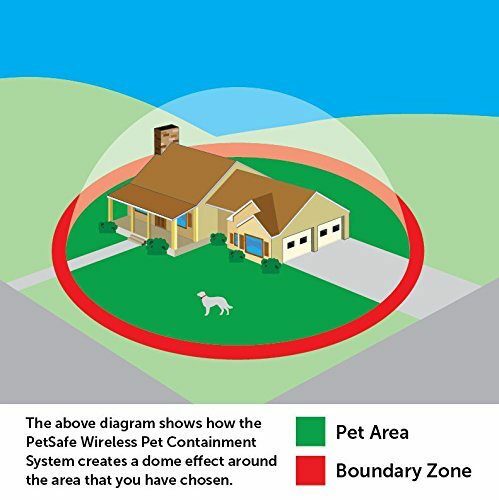 Unfortunately, there will be some cases where a wireless dog fence just doesn’t work because of the lay of the land or other external factors within the boundaries. In an ideal setting, you will have a flat area of ground with no elements that might interfere with the signal. You want a clean area where the device can transmit to the desired boundary and the dog collar without distortion. Distortion or interference may alter the shape of the boundary and ultimately confuse the dog. Metal objects between the transmitter and boundary area that may deflect the signal. Metal objects within 5-10’ of the transmitter. Metal sidings or metal roofs that may also interfere with the EMF signal. Driveways where cars may drive into the perimeter and disrupt the signal. If you have these problems, and there is no way to adapt the boundary or fix the issue, the wireless containment system may not be for you. In this case, you may find it is better to opt for the underground dog fence where there aren’t the same interference issues. ** Above all the ratings are given by our editors/authors based on their expertise. Click above name of the product to see the price on amazon. What should you look out for when choosing the best electric wireless dog fence for your pet? First of all, it is important to remember that when you are buying a system like this, you are not simply buying a dog fence. The battery pack, transmitter and boundary flags are all essential for creating a strong perimeter. However, your can’t forget about the quality of the collar and its impact on the dog either. Each component has to work together for a seamless, reliable system that maintains a consistent boundary and provides the right warnings to the dog. The transmitter generally sits in the middle of the yard and transmits out across a determined radius. The bigger the radius, the more room the dog has to roam around. Some systems require a little manual work to install the wires and boundaries in the right place, so it is important to look for a system that is both easy-to-install and reliable. It is also important to remember that even the best invisible electric models can be affected by interference from other signals and metallic objects. It is always best to test out the kit and understand the terrain before fitting a collar on a dog. As for the collar, there are different types of invisible electric fence available with different pros and cons. The first consideration here is the type of response seen once the animal reaches the boundary. Some emit a static charge and other use noises. It all depends which you and your pet are most comfortable with. It is also worth looking at the weight and adjustability of the collar. Not all collars suit all breeds. Many have upper and lower size and weight limits so be sure to check the specification. We are starting out with one of the more reliable models that ticks all the boxes when it comes to the top features of the best wireless dog fences. It is all about creating a strong perimeter, with room to play inside, and a good collar. There is no in-ground installation so it is a simple set up with a fairly large perimeter. There are 50 boundary flags that reach out to 90 feet in radius. It is seen as a great portable option for all types of dogs. A choice of static or tone. Adjustable waterproof collar from 6-28 inches. Unlimited number of pets on one system. Test light and battery indicator. Unfortunately, there is still the typical risk of interference and the awkward round shape. There is also the size restriction of minimum 8 pounds. The good news is that most of the problems are the sort seen in all models. It is easy to see why this is one of the more popular models, but it is not the only choice. 2. 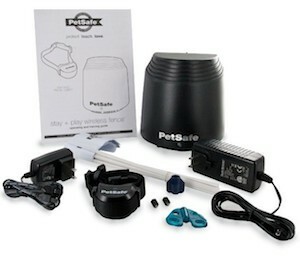 PetSafe Stay + Play Wireless Fence - Best for portability. One of the reasons that the PetSafe model above is number one model mentioned here is the wide appeal. 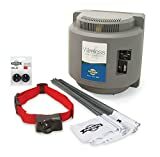 This alternative PetSafe model is similar in that it is from the same company with many of the same parts and features. The difference is the sense of portability. It is a small, portable device that is easy to set up wherever you go with minimal installation issues. This model shares many of the same positive points in the features, like the indicators, guides and markers. There are some differences, but it comes out ahead as a portable model. The transmitter is much smaller and easier to carry around. Also, there is a lighter collar that can be used on slightly smaller dogs and even cats. Furthermore, the transmitter covers a 44 to 210 foot diameter and a 22 to 105 foot radius, so is a little bigger than the one above. Once again we see the same old issues with interference and circular shapes. 3. 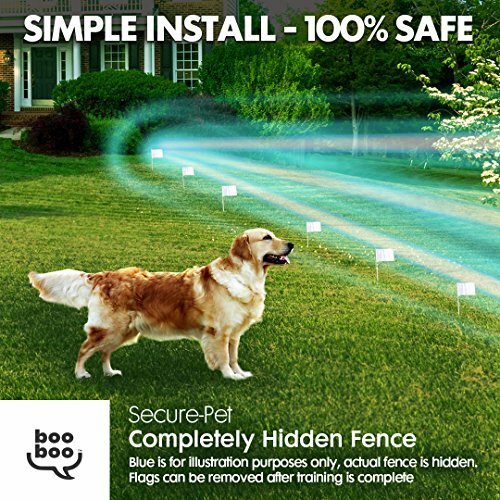 Sit Boo-Boo Unseen Hidden Electric Dog Fence. This option is a bit of a wild card. We wanted to include it here because the sales pitches talk about the dual use as both an in ground and above ground system. This is unusual, as these devices are typically one or the other. This gives the impression that users can great an adaptive, long-range boundary without the hard labour. There is no doubt that this is an effective system. The transmitter connects well with the collar for effective static correction as needed. There are some great reports from users that saw quick changes in the behaviour of both their collared dog, and neighbour dogs that got too close to the wire. This is actually quite misleading because this really is designed for in ground use rather than typical wireless use. The instructions talk about the shallow trenches and work involved. Those that do attach it directly to fences find it can break a little easily. This isn’t the wireless system that most buyers are truly after. 4. Pet Control Wireless Electric Pet Containment System. This model from Pet Control HQ is a simple, customisable model for multiple dogs. The transmitter sends out a correction to both collars with adjustment to the settings as needed. This 2 dog system is great for families moving to new properties where both animals need to get used to a new space. The main benefit to this system is the adjustable nature of the settings. The first advantage here is that users can set the intensity to their liking via a simple knob on the transmitter. Then there is the ability to use a warning beep and a static correction to help warn the dog when it gets close to the boundaries. Other advantages are the waterproof housing and the LED indicators. The biggest issue with this model is the short battery life. It is easy to tell when the device needs to be recharged, but it happens far too often. Others have had problems with sharp contact points. 5. 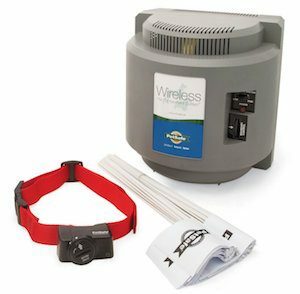 Petsafe PIF-300 Wireless 2-Dog Fence - For large areas. Another fence that has a lot of great features is this Petsafe model. There are some nice features to this set-up. It work to correct your dog for 30 seconds and resets itself when your dog reenters his "safe" zone. 2 probes for long haired dogs. 2 probes for short-haired dogs. Two rechargeable batteries with charger. AC adaptor with power cord. The main selling point here is that it has one of the widest areas – up to11 acres with 75 flags rather than 50. 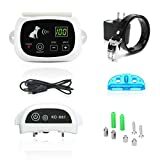 There is also the waterproof collar, different probes for long and short-haired dogs and two rechargeable batteries, so it shouldn’t run out. 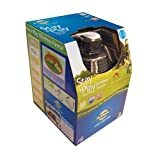 So why is this model 5th on the list compared to those other PetSafe models above? The simple answer is the installation process. There are problems in narrow or roadside properties without the addition of the in-ground wires. Therefore, installation is not as easy as with the others. Also, it is not as portable and more expensive. 6. 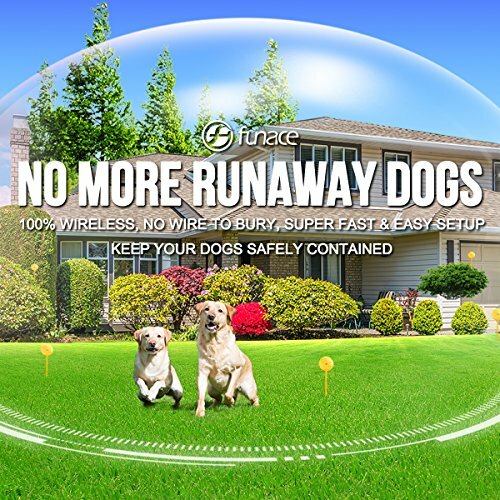 Funace Wireless Pet Containment System Invisibe Electric Dog Fence. One of the biggest issues with the fences above is that general issue of a circular area. While this makes sense in terms of the technology, it doesn’t fit the shape of the standard yard. This unit is expandable up to 17 acres with 500 feet of cord and will not have any dead spots or transmitter holes. There are 50 training flags & 50 cords. Adjustable dog collar and wireless receiver. 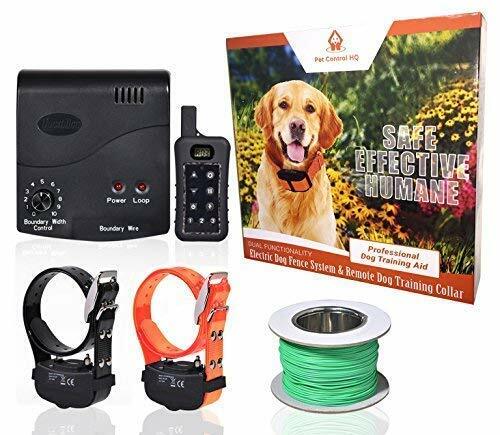 There are other positive points here to appeal to owners, such as the adjustable, waterproof dog collar and wireless receiver and the fact that it is designed for multiple dogs. The biggest problem here is that it is difficult to set up this shape. It needs a shallow in-ground boundary wire and additional transmitters for areas over 5 acres. Some find that the battery isn’t as great either. 7. 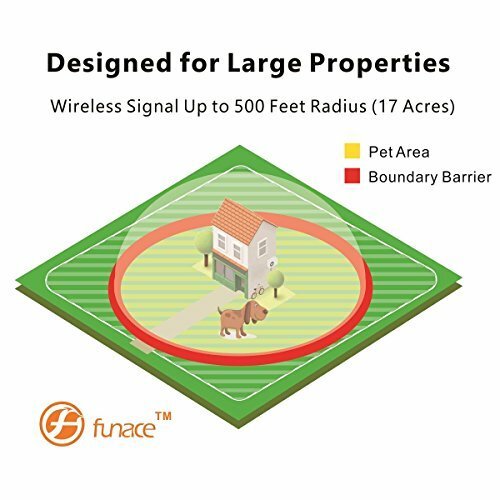 Perimeter Technologies Wire-Free Wi-Fi Dog Fence. The final model to consider in this guide is one that claims to be smarter and a bit less rigid than some of the others. It has a highly integrated signal chip that allows a constant link between your dog and the Smart Station. This then "intelligently" tracks your dog's location on a constant basis. Advance wire free base station. 2 rechargeable/replacement lithium ion batteries. Two rechargeable/replacement lithium ion batteries. A lightweight, waterproof and durable collar. In addition to this, it also has more levels of corrective static than other models. The problem here is that it is not as reliable as it could be. The system will fail if you have metal objects on property or if your area is filled with dense trees. Some may also find that it is a bit expensive. This system is one that comes with a lot of great promises to appeal to cautious dog owners. There is the claim that it is 100% safe and harmless – this would appear to be because of the means of correction and the quality of the collar. This model comes with rechargeable transmitter and collar. The adjustable neck size of 0-24 inches. A safety system to prevent over-shocking. One feature that immediately stands out with this model is the range of the adjustable radius. Owners can take it down as small as 40ft for small outdoor pens as well as much larger yards. There are also positive comments about the levels of static and tone, which some appreciating the sensitivity. The main problem here is a strong inconsistency in performance – both between user comments and in day to day use. Some worry that these issues will affect the training regime. Others say they simply received faulty merchandise and had to return it. Sales photos for this kit make it seems like quite a complex system. There is a great looking transmitter with a digital display for the radius, intensity and some basic controls for the power and settings. There is also a receiver that clips to the adjustable collar, a charger and a series of contact points. There is also the chance to buy this as a three dog system if needed. Different contact points for different coats. Those that have good results with this collar do appreciate the different settings and range of the device – even if some aren’t sure that it is truly measured in meters. Some have bought this as an affordable replacement for broken models and been pleasantly surprised by the results. The biggest problem – besides some reports of inconsistencies in the shocks – is the build quality. This is a cheaper option, and it should in some of the components. Some warn that this isn’t truly waterproof. Others talk about the sensitivity of the system with non-metallic objects. As you can see, there are some clear pros and cons to each of the models mentioned here. It is easy to be drawn to models like the Friendly Pet model because of the shape, but you could be sacrificing reliability and convenience. In the end, it is better to go for a reliable circular model with minimal installation issues and a comfortable, adjustable collar. Each system will have interference issues, so don’t let that put you off with those top models. Benefits Of The Wireless Pet Containment Systems. The biggest issue for many dog owners with in-ground electric fences is that this is a time-consuming process. It can take a while, and a lot of hard work, to lay that wire in the ground around the property. The larger the boundary, the greater the effort. Also, all this heavy duty cable and those extra tools aren’t cheap. These wireless models are more budget-friendly and can be operational in a couple of hours. It does take time to set the flags and radius in the right place, but it isn’t back breaking labour. 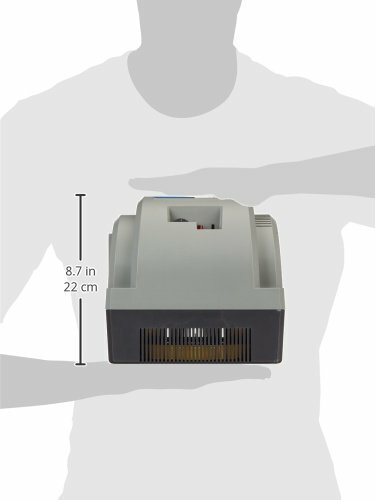 This design also means that the system is portable and easy to adjust. Users can take it to new properties so pets can get used to new yards. The adjustable radius makes it easy to create the ideal space and boundaries – even if there is that limitation of the round shape. The best options should also have plenty of settings on the collar for different correction modes and intensities. Additional Information to Consider When Using a Wireless Dog Fence. As we mentioned in the FAQ section, these wireless fence systems will require training on both the dog and pet parent's behalf. Although, the training can be time consuming (depending on how stubborn your pooch can be) the following tips can make the transition move more smoothly. Putting the transmitter collar on your dog and just letting him go into the back yard will not work. Remember, this wireless fence is not a physical barrier, but rather an invisible one. Your dog's first reaction to being shocked may be fear, confusion or even panic. Some dogs may try to run away from the static, just to be corrected again and again. Other dogs may just sit in fear of moving. 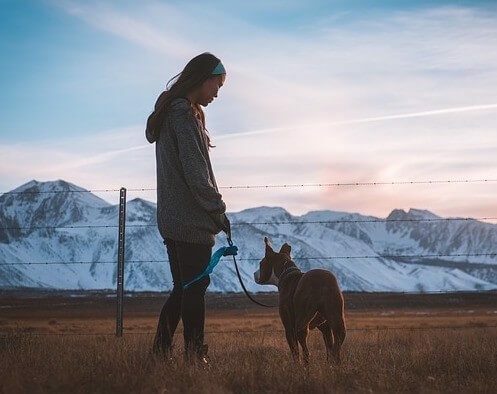 For these reasons, it's important that you be there with your dog to help him/her become accustomed to the correction and to help guide your dog back to the safe zone. Your dog must learn the proper boundary behaviours from you, so for this reason training your dog is highly recommended with wireless fence systems. To properly train your dog, walk him the perimeter of your yard. When he crosses the boundary and is statically reminded, gently pull him back and issue the "sit" and "stay" command. Praise and reward him for a job well done. Experts recommend allowing your dog to wear the transmitter collar at least 3 days (up to 7) before activating the wireless fence. This allows your canine companion to get used to the collar before it begins transmitting the correction. This process will also allow your dog to associate the static correction with the boundaries of the yard, not the collar itself. Do not leave the correction collar on for more than 12 consecutive hours. The static prongs on the inside of the collar can cause skin irritation, so remove the collar at night or if you are away from home for an extended time-period. Pick the spot for the invisible gate point. Use the "sit" and "stay" commands at the invisible gate. Cross the exit point with the "come" command. Your dog will not be statically corrected. Use the same spot every time you want to exit the perimeter. Are less expensive than building a physical fence. Are portable. Some units can be used for camping or holiday homes. Can be taken with you to a new home. Provide more freedom for your dog. Are less worrisome. Your dog can't escape the yard via digging or jumping over the fence. Hassle-free. No more tangled tie outs or ropes. There is a lot to consider when looking into these wireless fences. It is easy to understand why some owners may be cautious about using the approach on their dogs, but they really can be a great tool with the right training. It is better to have a secure dog that learns not to get static correction than one that is free to roam and could get lost, or worse. It can take some time to teach the process to some dogs, but the best system will provide a simple set-up in a wide area with a reliable response. The collars are adjustable and can fit many different dogs. The pros of these wireless dog fences really do outweigh the negative aspects. Consider the size of the yard, look at the features on offer and take your time to train your dog. With time, your dog wont get corrected at all and will be as safe as can be. Getting a wireless fence for your dog is a big decision and investment. To help you make an informed decision, here are five of the most frequently asked questions about the best dog wireless fences on the market today. Q1. Will the correction static hurt my pet? Although, each of these dog wireless fence systems do come with their own static or tone controls, the general reaction to exceeding the perimeter boundaries is a light static current similar to the shock one would get from rubbing socked feet along a carpet. On all these systems the correction level is meant to get your dog's attention, not to invoke pain or injury. Q2. How old does my dog have to be to start invisible fence training? This question may greatly depend on the breed and size of your dog. However, most experts agree that 6 months is a safe and effective age to begin wireless fence training. Also be sure to check your individual system's weight requirements before your begin training your dog. Q3. How long do I leave the training flags up for? The training flags are meant to be used as a guideline and visual reminder for your dog's perimeter. Most systems suggest leaving the flags in place for a minimum of two weeks, but can be left in place up to 30 plus days. Q4. Should my dog be on or off the leash for the first time in the wireless fence? 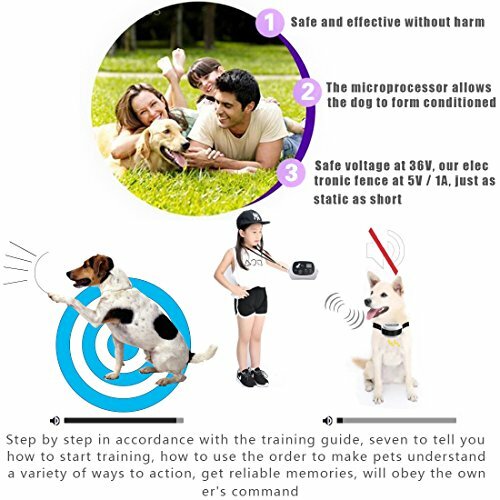 The whole idea of a wireless fence and the correction static it brings with it will be a new experience for your dog. Experts recommend using a leash to help guide your dog back to the "safe" zone while he is getting use to the containment system. Q5. Is this really a humane way to train my dog? While the correction static is a mild "zap" it should not cause your dog long-lasting pain or discomfort. Please be aware that all electronic training devices to require interaction and additional training on the pet parent's part. These systems are not meant to be used as a "clamp the collar on and let em go" alternative.